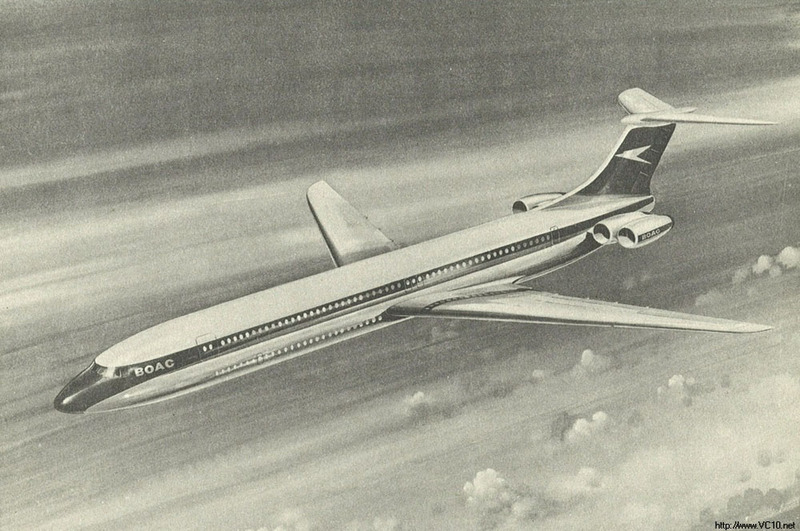 Early on in the VC10 program there were plans for a larger version, even bigger than the Super VC10. Now that the A380 is in regular service we are becoming used to a double-deck airliner but if plans had gone ahead, it would have been nothing new. Brochure for the double-deck proposal. 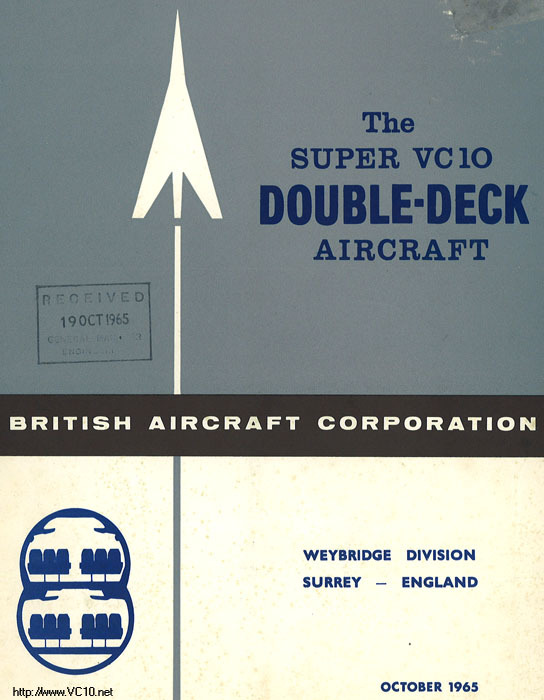 In a brochure from October 1965, with the first Super VC10s having been in service for just eight months, BAC informed anyone that wanted to know that they could have a double-deck Super VC10 in service by 1969. 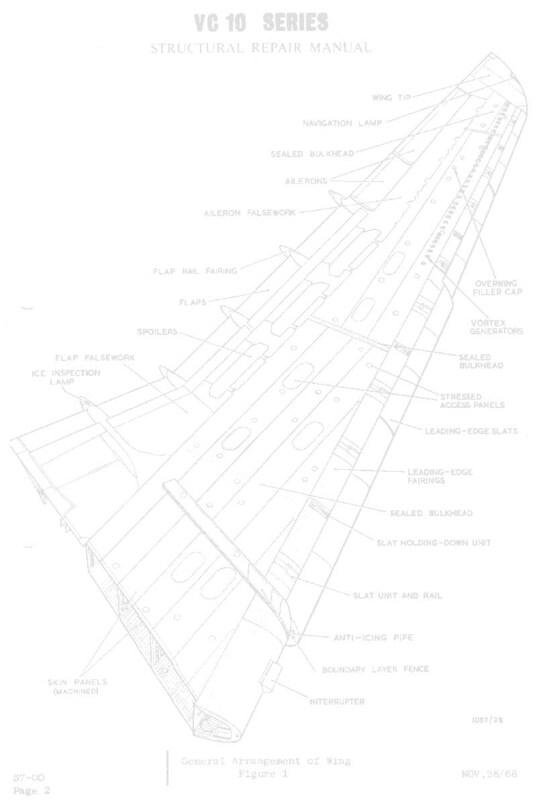 This was not an entirely new idea, the plans for larger VC10s had been laid already, but this was to be one of the largest variants of the basic VC10 design. Initially the Super VC10 had been changed into the 265 seater 'Superb' by creating a larger lower lobe on the fuselage which held another passenger cabin forward of the wing root. With a longer fuselage length than the Super VC10 this was to be an aircraft of unheard of size. The lower cabin would have held four-abreast seating with the main deck offering six-abreast for a total of 265 economy class seats. Obviously the designers wanted even more in an attempt to lower the seat/mile costs. 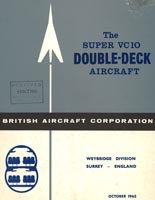 The proposal set out in the brochure shown on the right is for 295 economy seats, double the capacity of a Super VC10. What had been changed? The type 1180 (not to be confused with the C Mk.1 tanker conversion of later years) sported a fuselage of which the lower lobe had by now grown to the same width as the upper lobe, enabling six-abreast seating on the lower deck as well. The direct operating costs of this variant would have been greatly improved, in part due to a reduction in specific fuel consumption for the Rolls-Royce RB178 engine. This engine was to be a 27.500 lbs design with a high bypass ratio which seemed to be the next logical step in the gas turbine's evolution. The Rolls-Royce Conway engine on the VC10 was the first engine to use a bypass, although it was a small fraction of the air flowing through the engine, the bypass ratio being only 0,3. In the end the RB178 never did enter service and the large bypass engines turned up from the other side of the Atlantic ocean. For the type 1180 BAC also increased the design weight compared to their earlier proposal, this improved the payload/range characteristics of the aircraft. The shape of the future? The type 1180 double-deck Super VC10. Along with the type 1180 this brochure also introduces the type 1181, this is just a small change as this variant sacrifices 9 seats for an extra toilet in the lower 'saloon' and extra storage on the main deck. More changes were possible, what to think of a full freighter based on this fuselage design? A main-deck freight door was offered as an option and the lower deck had a freight door fitted for the forward (passenger) compartment, enabling a mixed freight/passenger capability in various mixes. Thinking of the combi versions of the 747 and DC-10/MD-11 families that were later developed, and the services flown by EAA in what was essentially also a combi version of the Super VC10, this was one vision that became true. What is striking in the text of the brochure is that the passenger appeal of the VC10 was very evident. BAC states clearly that the rear-engined VC10s are achieving higher load factors than underwing engined aircraft and the type 1180 is designed to cash in on this. In clear terms they state that the double-deck VC10 incorporates a new philosophy in passenger accommodation and an entirely new engine concept to introduce a new development era for long haul subsonic passenger transport. Want to know more? A selection of pages from the brochure is reproduced below. There are large graphics on these pages so they may be slow to load.